In the midst of a season for high-A San Bernardino where he hit .302, Ruben Santana explained to The San Bernardino County Sun his approach at the plate. "Hitting is being consistent," Santana told The Sun in July 1991. "I try to improve on the little things at the plate and remain consistent." Santana worked to improve those little things over a professional career that spanned 12 seasons. He made it briefly to AAA, but his hitting work never got him to the majors. Santana's career began in 1988, signed by the Cubs as a free agent out of his native Dominican Republic. Santana played his first season at single-A Charleston. His season consisted of 13 games. 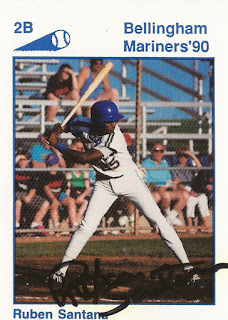 He moved to the Mariners for 1989 and played with the team's Dominican club. 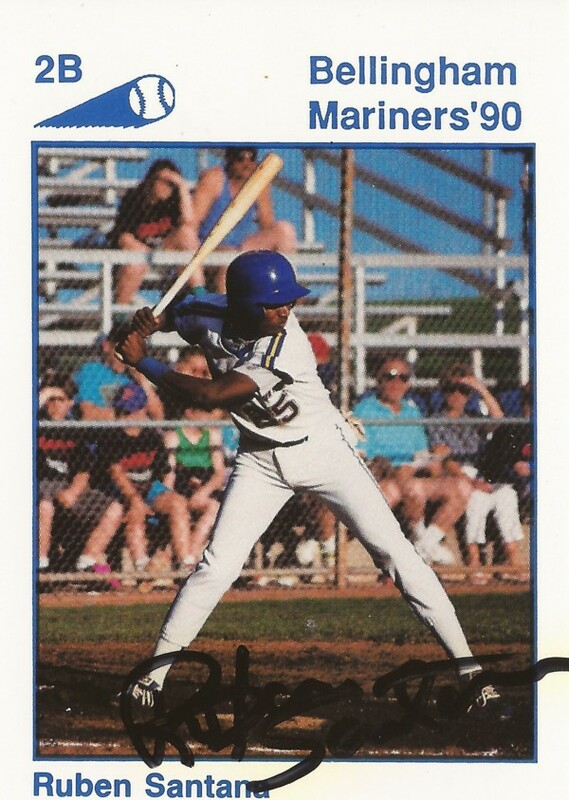 Santana moved stateside for 1990, getting time with short-season Bellingham and high-A Peninsula. He hit .238 in 73 games. He got a brief five-game look at AA Jacksonville for 1991. He played the balance of the year at high-A San Bernardino, where he hit that .302. Santana continued his consistent hitting in 1992 at Peninsula. He hit .294 there. He then returned to Jacksonville for all of 1993, hitting .301 with a career-high 21 home runs. He hit his fifth home run of 1993 by late-April, after hitting eight all the previous year. By that August, his season had him in the discussions as part of the Mariners' future. Santana played at Jacksonville again in 1994, then at AA Chattanooga with the Reds in 1995. He returned there for 1996 - and got a brief six-game look at AAA Indianapolis. Called back to Indianapolis for the playoffs, Santana went 2 for 4 in one game and picked up a third hit in another. After skipping 1997, Santana played two seasons in independent ball with Adirondack, Fargo-Moorhead and Nashua. He then played two final seasons in Italy, ending his career.